Generating a cartogram of access to pain medication around the world. Okay! Now that I have my data in a shiny new shapefile. Time to make some cartograms using ScapeToad. I am working on this project with Kim Ducharme for WGBH, The World, for a series on cancer and access to pain medication, which highlights vast disparities in access between the developed and developing world. 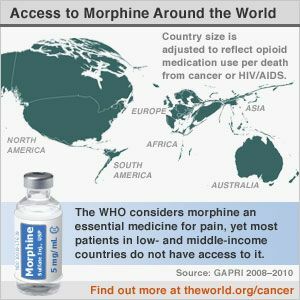 Below is a snippet of the data obtained from GAPRI, showing the top 15 countries for amount of morphine available/used per death by Cancer and HIV and the bottom 15 for which there were data. Based on these numbers of morphine/death, in a basic cartogram where each country’s area becomes proportional to the metric, Switzerland would be 60% of the size of the US. But wait… this wasn’t what I expected, gosh that’s ugly and hard to read… And so starts the cartogram study and tweaking experiment. Is there a perfect solution? Note the countries of Europe are too constrained to get to their desired sizes, so there is always some error in these images. Regardless of that there are two issues: 1) Europe/Africa/Asia are so badly distorted as become nearly unreadable, and bring the emphasis to a fish-eye view of Europe with weird France and Switzerland shapes. 2) This seems to make the whole story about Europe, de-emphasizing the US and Canada, which have higher usage than any of the European countries and also taking the focus away from shrunken Africa/Asia and South America. 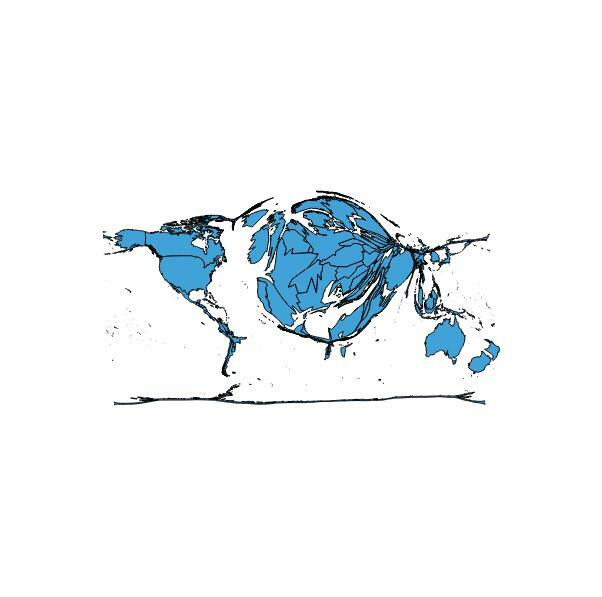 Well, this is a quandary, the “correct” image is too confusing to be useful and takes the focus away from the story about the developing world and into what-the-?-is-this-distorted-picture land. 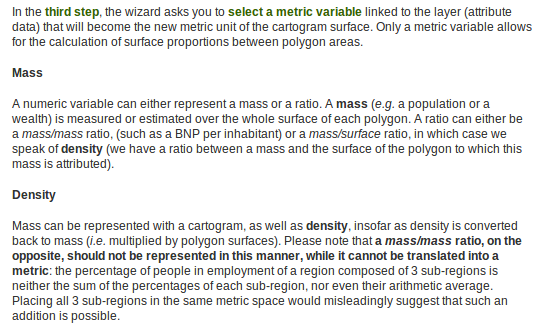 But the “density” image is not “correct”. From here I spent some time trying to generate a less distorted mass based cartogram. By running the cartogram generation on each continent separately I generated much less distorted images of Europe and Africa (Asia still needs some work). Shown here are the raw outputs for these regions in green, purple and pale blue respectively. 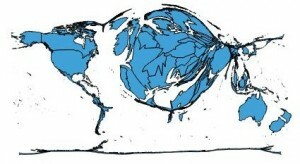 To piece the cartogram back together the continents needed to be scaled and translated to the correct locations. Here is how far I got in that process. Europe is much easier to read and Africa is a huge improvement. Asia/the Middle East are still quite confusing, potential for improvement breaking this into more chunks, but it was becoming a more and more manual process and the output image still isn’t “satisfying”. 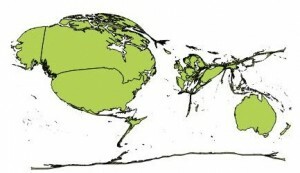 In the end it is possible to generate a lot of different cartogram images. Some of which are suggestive of the story you want to tell, none of which are easily deciphered to provide actual data numbers. Keeping in mind that a cartogram isn’t a tool for communicating precise data measures, I think pick the one you like that makes sense to you vis-á-vis your data and the story you want to tell, don’t overstate the accuracy of the image, and provide other means to get at the actual numbers. 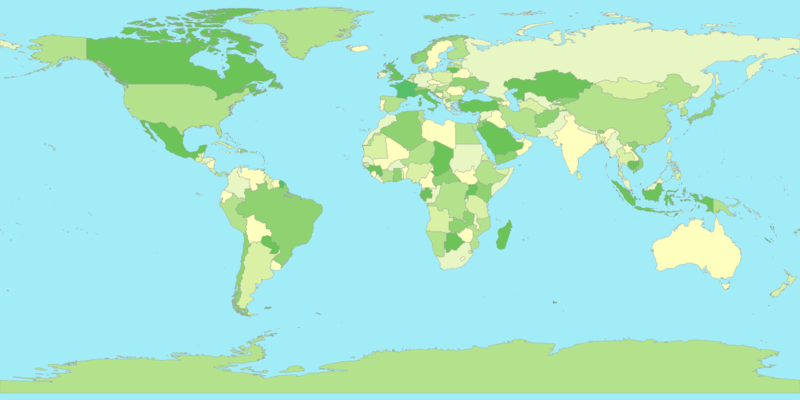 For example, I created an alternate view in this choropleth map of the same data. The final image is published now as part of PRI’s The World new series on Cancer’s New Battleground — The Developing World. This entry was posted in Maps and tagged pyshp, ScapeToad on November 23, 2012 by Zia. As part of a cartogram generating project I need to get data from a .xls file into a shapefile for use with ScapeToad. Reading the excel file is easy with xlrd. Shapefiles? that is new territory. Thematic Mapping: http://thematicmapping.org/downloads/world_borders.php TM_WORLD_BORDERS_SIMPL-0.3.zip. Which is licensed under the Create Commons Attribution-Share Alike License. This license is not appropriate for commercial use and the author didn’t respond to my question regarding other licensing options. 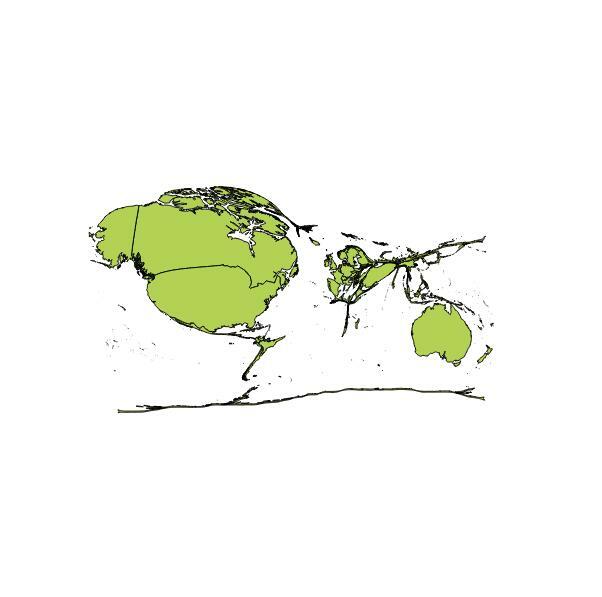 Natural Earth: On a tip from Andy Woodruff, I switched to using Natural Earth shapefiles which are licensed completely in the public domain, suitable for anything you want! 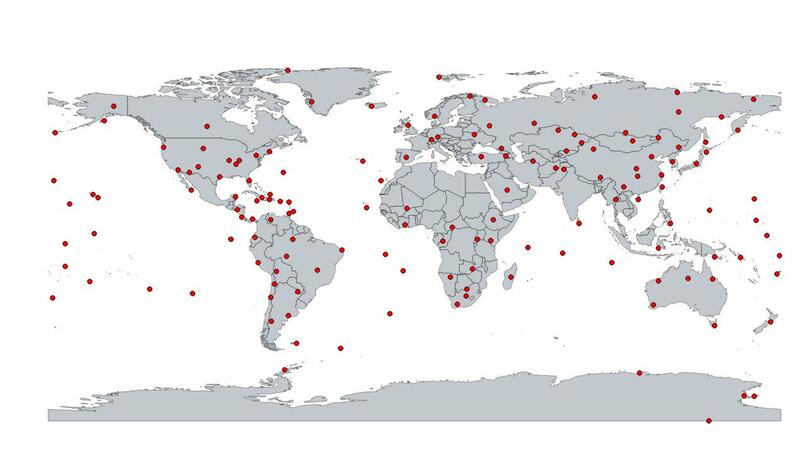 Note, I discovered that the most zoomed out Natural Earth file, “ne_110m”, didn’t have shapes for some of the smaller island countries in my data set, so switched to using the “ne_50m” versions which included everything I needed. Next step, getting custom data into the shapefile. Since I do most of my data processing in python anymore, I was happy to find a python module for read/write/editing shapefiles. Unfortunately, pyshp.py is not the best maintained module. I used pyshp version 1.1.4, because it was packaged in ubuntu. After discovering a number of bugs I realized they have already been reported but nothing significant seems to have been fixed in 1.1.6. So I will just document the workarounds I used here. 1st pyshp 1.1.4 workaround: Renamed the shapefiles to remove any dots in the file name (the 0.3 in the case of thematic mapping shapefiles) because pyshp can’t handle extra dots in the file name. 2nd pyshp 1.1.4 workaround: Massage numeric data you are adding to a record to have the correct precision. My whole reason for using pyshp is to add data from excel into the shapefile. This means adding fields to identify the data and then adding the data to the record for each shape. The format of the new attributes (a.k.a. fields) is well described here. In my case I want to add numbers for example: sh.field(‘MY_DATA’, ‘N’, 6, 3). The number args are width and precision, where width is the total number of characters to represent the number and precision is the number of characters after the decimal. The above (6,3) can encode: -1.234 and 98.765. 3rd pyshp 1.1.4 workaround: When adding a new data field, pad all the records with default data for the new attribute. pyshp assumes when saving the file that the data is perfectly formatted, but doesn’t help too much when adding or deleting data. Records are stored in python as a list of lists, when the shapefile is written pyshp assumes that the records lengths equal the number of fields (as they should be). But it is your job to make sure this is true (if not the records will wrap around and become non-sense). Q-GIS is useful for inspecting shapefile attribute tables to discover issues and verify that your new shapefile works in an independent reader. In my case data wasn’t available for all countries, so I padded with a default value (appended to the end of all records when adding the field) and then looped through and put the correct data in the records for which data was available. Example here adding a new field for Numeric data and default data to all records. All my data is non-negative, so magic number “1” is for the decimal point. # add default data all the way down to keep the shape file "in shape"
4th pyshp 1.1.4 workaround: delete() method doesn’t work, don’t use it. pyshp adds an imaginary field for internal state tracking to the beginning of the fields list. If you are looking up field names in this list to find indexes, you should correct your indexes accordingly, there is not actually a field called ‘DeletionFlag’. After working around these bugs and massaging my country names to map from .xls to the names in the shapefile (17 cases of “Bolivia (Plurinational State Of)” == “Bolivia”) , I was able to use pyshp to generate a new shapefile with my data in it! Next up, cartogram-orama. This entry was posted in Maps and tagged pyshp on November 22, 2012 by Zia. I am learning to use pyshp.py (a pretty buggy but functional python module for reading and writing ESRI shapefiles) and Quantum GIS. As a quick demonstration I replotted the data from an earlier map. Q-GIS makes it pretty easy to adjust the appearance. The world map shapefile is from Natural Earth. This entry was posted in Maps and tagged pyshp, QGIS on November 16, 2012 by Zia.